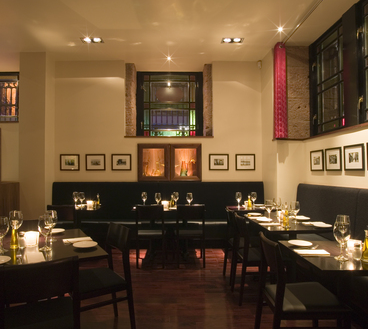 Situated in semi-basement level on the corner of Buchanan Street and Nelson Mandela Place and just a two minute walk from Glasgow's Royal Concert Hall, Amarone does a roaring business lunch and pre-theatre trade. Amarone's menus reflect the very best of traditional and contemporary Italian cuisine, made with ingredients sourced both from specialist Italian suppliers and from our local area. We use only the freshest produce and our dedicated team of Chefs will be happy to alter any dish, where possible, to cater for special dietary requirements or special requests. We had a great meal, food was excellent and the staff very friendly and helpful. Fabulous cocktails in the sunshine then a lovely 2 course lunch. Food, service and drinks all great quality and value for money. We will be back again soon! Was really looking forward to introducing my friend to my favourite place in Glasgow for a special lunch but sadly this visit wasn't great. Have ate in this restaurant several times and it never disappoints. The staff are friendly and service quick. The restaurant itself is clean, chic, lovely decor. The food is fantastic, tastey and fresh with a great choice to suit everyone. They have an early dinner menu which offers a great saving, although the main menu itself is reasonable for the food you receive. Waited quite a long time as food was we were told bring freshly cooked. When it arrived there were only 5 instead of 6 meals & it really was not hot. While my companions’ food was fine, my chicken was disappointingly dry and chewy, and the stroganoff sauce was bland and tasteless. I did not flag this up with staff as I did not want to embarrass my companion who was paying. Consistently good. Hot plates as well! Took mum for birthday lunch before theatre, food and service were brilliant as always. You never go wrong dropping in here for bite to eat. Very handy for concert hall with the pre-theatre menu too. We love this place. Food and service are excellent each time we visit. My first visit to Amarone in Glasgow, and it wont be my last visit. Excellent service from the team, the food and drink was excellent. Recommend the pasta with chorizo it was superb. I will be returning again when Im in Glasgow on business. Excellent meal, very friendly and efficient service. Had an amazing time the staff were so helpful and friendly. It had a very relaxing atmosphere.